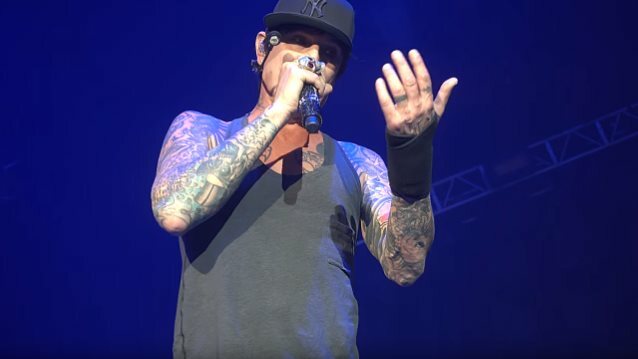 MÖTLEY CRÜE drummer Tommy Lee has spoken to Abu Dhabi, United Arab Emirates' The National about his recent wrist injury that forced him to sit out five North American gigs last month. ALICE COOPER's Glen Sobel filled in for Lee during this period, although Tommy did appear onstage to play piano with his good hand for the traditional set closer, "Home Sweet Home". "I'm back to 100 percent," said Lee. "I bruised a bone in my wrist, but after a serious double dose of cortisone that helped with the inflammation, and with the help of this little wrist machine to exercise it, I'm back to normal." According to Lee, repetitive stress injuries are common for hand drummers, along with issues like carpal tunnel or tendinitis. "I'm always getting injuries like bruised and bloody knuckles from catching a cymbal or the edge of a drum," he said. "Drumming's pretty physical. We sit at the back of the stage getting beat up like a workhorse." He continued: "Anytime you do something repetitive over a sustained period — and this tour's already been a year and a half — your body just says, 'I'm hurt. I can't do this.' But I'm all good now. They got me back into shape and I'll be slugging the drums like a maniac [at the November 20 MÖTLEY CRÜE concert] in Abu Dhabi." MÖTLEY CRÜE's "The Final Tour" kicked off last year and will end New Year's Eve at the Staples Center in Los Angeles after one more round of North American gigs. MÖTLEY CRÜE first announced plans for their two-year "Final Tour" by signing a Cessation Of Touring Agreement at a press conference in Los Angeles in January 2014, solidifying the end of their touring career with their last show ever on New Year's Eve at Staples Center in their hometown of Los Angeles. Since the announcement the band has been touring tirelessly to say goodbye to fans around the world. The 2014 leg of "The Final Tour" was one of last year's top-grossing tours, selling close to a million tickets across 72 cities and grossing more than $45 million.